What is affiliate marketing? It is results and performance-based marketing where commissions are earned only if a sale or action is taken. There are hundreds of affiliate networks that offer thousands of items to promote. Rarely if ever, will you find one that charges to become an affiliate. Most all networks are free to join. The upper-echelon systems might ask about your experience, and even then they oft let total newbies onto their platforms. Sometimes it will take a sponsor to get onto the platforms of high commission paying sites. They don't want to deal with neophytes,only seasoned professionals who make a lot of sales. It takes about 10 minutes to fill out affiliate networks' information forms that include your name, address, banking info and tax ID vitals. You should create a sole proprietorship or LLC for your new business. You can, however, simply use your social security number, too. You can frankly start marketing an affiliate product for free by using free traffic like Instagram, Facebook, Twitter, Pinterest and more. It's highly suggested to use landing and sales pages to capture potential clients email information to retarget them later. Such a system costs about $29/month. If you choose to create a blog or website around niche affiliate products, you'' have to buy a domain name and hosting. These costs are $12 and $4/month on average. For step-by-step instructions on how to build a WordPress site, visit this page. Most transactions online are done via PayPal and an account to open there is free as well. Affiliate marketing is also referred to as result or performance-based marketing, so the harder and smarter you work, the more results you'll likely experience. The kicker is you can do it from your home, while traveling or from the handiest of all devices, your cell phone. You can start early, start later in the day and work without a boss watching over your shoulder. As romantic as it all sounds, to be successful you must work hard. With the right strategies, affiliates can create several streams of passive income. Employ wit, wisdom and market insights onto the website or blog you create around the affiliate products you are populating web pages with. For example, let's say you decide you want to promote ski vacations by which each booking gets you $800, plus free lodging for each article you write about the destination. To attract skiers to a particular area, you build a website around the latest ski techniques or latest in ski fashion. Perhaps you have videos of past ski vacations or snowboarding experiences that are appropriate to the site. The sky's the limit on how creative you choose to be and, as with most audiences, it does demand you keep up with the latest trends or create your own trends based on the marketplace. In creating a blog around affiliate links in a particular niche, an affiliate has to become an authority on "their" chose subject. This leads to becoming a well-admired educator who contributes to the well-being of society as you're solving others' problems and creating solutions for them. Online entrepreneurs prefer affiliate marketing to all other forms of earning income on the web because it's simple; there's no need to hire other people; there's no need to create a bigger office, have supplies, et al. You also do not have to deal with customers, have face-to-face conversations or be responsible for updates, product creations or meeting any deadlines. There's nothing to keep in-stock and no one to answer to. Double the fun, knowing the sky's the limit. You, like many others, could sell millions and millions of dollars of affiliate products. The Millionaire Mentor reportedly sold over $7 million on Instagram alone. Affiliates often pave their own paths by working with local businesses by becoming the conduit who grows client bases. This can be done for percentage of leads generated or sales or, more commonly an upfront payment for marketing services that are outlined. Facebook, Instagram and other social media ads are used to drive buyers to clients' websites or storefronts. Its benefits are instant payments and helping a local community thrive. Within minutes an affiliate can start making money by foregoing a website and simply blasting links on social media platforms like Facebook, Instagram and Pinterest. Most successful campaigns will have opt-in and landing pages, which take only minutes to set up. Aside from having a global reach, a website/blog works while you sleep all year long. If populated with all the "write stuff" an affiliate's site will generate income all-day, everyday. Affiliates who make $10K/day, undoubtedly have stupendous websites being leveraged by automated marketing systems like Tailwind or Hootsuite. With each blog post an affiliate adds to website, another affiliate product or two is likely added. This innately expands appeal and client base. As an affiliate's site grows and seasons online, their incomes generally grow exponentially. A British internet company reported over 21,000 teenagers are making over $95K/year affiliate marketing. The Huffington Post brings in a reported $14 million/month on PPC advertising, while simple blogs headed by seasoned gurus are making $100K to $160K/month. Inspirational is the word here. Per the internet marketing dude, the average income for an affilliate is $55K/year. Affiliates don't have to worry about expiration dates of products, updates or being booted out of business as it's totally your business, driven by your (the affiliate's mindset) passion. Affiliate marketing is also great for your family and social life. In many cases, entire families log onto sites to contribute their takes on subject of niche. Legitimate work-at-home jobs are plentiful, but growing an online business as an affiliate can create passive income that lasts for years. What Is An Affiliate? What Are Affiliate Marketers? Affiliates are the driving sales forces of thousands of companies. Also called publishers, affiliates are rewarded commissions for selling another company’s product(s) or generating leads for a company. No money is exchanged until results are achieved. This is also called performance-based marketing. Note, some companies call their affiliates “referral agents” or “associates.” Motor Club of America, for example, calls their affiliates referral agents or recruiters. Amazon, on the other hand, calls their affiliates associates. Affiliates are associated with companies on an independent contract basis. They are responsible for their own taxes and normally promote products under a sole proprietorship or limited liability corporation. Each affiliate must provide “advertising” companies with 1099 information, which is normally just a social security number or employer identification number along with current address, phone number, email address. Independent contractors must abide by the terms and conditions set forth by company they are promoting. The best part of affiliate marketing is you are not responsible for creating products and are not held responsible for their faults. By and large, affiliates are entrepreneurs. They may also be dubbed “solopreneurs” as a significant number enjoy working on their own without a staff and commercial place of business to pay for. Solopreneurs outsource when needed and treasure working from home or while traveling. Here’s the USA government compliance outlines. A successful affiliate knows their audience inside and out. They put themselves in their shoes and evaluate what problems need to be solved by researching issues, asking questions and using such sites as Google Trends, analytics and others data sources outlined in link. In honing in on audience’s needs an affiliate will become more successful. The age-old adage is true here: In order to receive, you must give. Google knows this is a formula of good business. Affiliate marketing is for sure newbie friendly. It is also the least expensive way to make money online. An affiliate does not need a website, though it’s recommended. Anyone can get into an affiliate network, get a link of a product and start promoting it that day with just a landing page or that link, though direct affiliate links aren’t allowed on some social media sites. Some affiliates only use their business page on Facebook to market. Some only use Instagram or Pinterest to market products. One thing is certain across the board, however, is the more adept an affiliate is on social media, the more likely they will succeed. How Much Do Affiliates Make On Average? "The credit belongs to the man who is actually in the arena; whose face is marred with dust and sweat; who strives valiantly, who errs and may fall again and again, because there is no effort without error or shortcoming." Cost Per Action (CPA) Marketing is also known as Cost Per Acquisition Marketing. It is an affiliate model where the advertiser/vendor pays affiliate/publisher for getting a consumer to take an action. The action is closing a sale, filling out a form, signing into a membership site, downloading an app or obtaining a lead. (The vendor lists their product on an affiliate network.) Typically, CPA is the act of obtaining new clients for vendors by selling products. The following–Pay Per Click (PPC), Pay Per Lead (PPL), Pay Per Download (PPD), Cost Per Impression (CPI) and Cost Per Click (CPC)– are forms of CPA Marketing, but paid per lead, download, impression or click. Google, Facebook, Bing, Amazon, and a slew of other traffic-driving sites, charge affiliates per click, impression or download when they run ads on their platforms. Paid advertising on the aforementioned platforms is a lucrative form of CPA Marketing as the audiences are extremely targeted and the traffic is brought directly to affiliate ads. Affiliates generate an unique link from affiliate networks’ product lists. These links identify affiliate and are most often shortened by programs like bit.ly, prettylink.goo.gl or tiny.URL. The shorteners track links to affiliates. Cookies, phone trackers and promo codes are also ways used to track affiliates’ efforts. There are three primary ways to market CPA offers, but intricate to this species of marketing is that it is digitally based, meaning the commerce is computative. Upon joining an affiliate network, an affiliate will select a product to promote. The network then generates an unique link with affiliate’s user name in link. The vendor supplies affiliate with an arsenal of media marketing material such as email swipes, banner ads, videos, articles and more. More times than not, the affiliate will add their spin on the material by creating landing pages, bonuses, sales funnels and blog posts to help promote and sell product. Below is a link from Clickbank. The link codes everything to the affiliate, which is how they track what money the affiliate brings in. Do note, CPA affiliates sell not only digital products, but physical ones, which is referred to as e-commerce. An affiliate link from ClickBank. Affiliate marketing can very well be compared to playing in the Game of Thrones or, better yet, a game of chess. For in the internet sphere, where content is king and traffic (visitors) is queen, pawns, knights, bishops and rooks might well be looked at as modules of attracting wealth and sovereignty to the monarchy. Each piece is intricate to the whole commonwealth, but have certain inherent and immanent limitations, which is analogist to the type of affiliate marketing methodologies practiced. The Pawn: The pawn is a level one affiliate, who is a bit lowly and contributes just enough to be included in the game, but not enough to create wealth and prosperity. Figuratively speaking, pawns are more than likely beginners and haven’t yet mastered the art of playing internet chess. With little or no strategy, pawns have limited, self-imposed means to acquire the precious gems found upon the wireless landscape that criss-crosses the globe. Reportedly, most affiliate marketers are pawns in need of a marketing method that works and well as the spiritual wherewithal of staying consistent, persistent and focused. The Knight’s Marketing Method: The knight is a gallant horseman who champions the marketing model of going straight to a bull’s eye. With no fooling around, the knightly affiliate aims for the riches with a lethal dose of sweat equity or healthy budget to get (or purchase) traffic from Facebook, Bing, Google, Taboola, Udimi and others. True to this nobleman’s personality, the knight’s arsenal includes a great cause (product), an opt-in page adroitly offering some sort of lead magnet (freebie), a landing page/sales funnel that entices potential clients to buy, and then the vendor’s actual product purchase page. To prepare for their money-making crusade, the knight will join a reputable affiliate network (listed below), then select a product based on its gravity or Google Trends. Gravity means how much it is currently selling. Then they will review the vendor’s collateral material. If the vendor has effective email swipes, banner ads, videos, html ads, articles, a strong sales page and commission structure, and is in the vertical they prefer to market, the game is on upon generating their affiliate link. Here are the exact and simple next steps: Create Ad | Choose Mode(s) To Get Traffic | Test Ad | Success. The traffic will likely come from Facebook ads, Google AdSense, Bing or YouTube. Though stellar, stealth and highly regarded, the knightly approach is considered a Level 3 in the internet income game as it does not build sustainable growth that spawns into passive income. The knight here is acting as a bachelor who is highly regarded, but is without a home, since he has no website as his business hub. His investment in this marketing method isn’t a long-term asset like that of a blogger or webmaster creates. The king and queen are each assigned a bishop who has oft been known to have a fellowship with parishioners and townspeople. This epitomizes the bishop marketing method as the marketer tends to outreach to the community by engaging on social media, webinars, podcasts, YouTube, Facebook, Twitter, Instagram and more. This marketer actively builds an audience of followers by contributing helpful information to others. He/she will create a YouTube channel filled with “how to” videos or add useful messages in forums, other blogs or RSS feeds. The bishop’s approach is very targeted and their relationship with the products they advertise is deeper than the knight’s. Super Affiliate Sean Bagheri practices the bishop method. On his YouTube channel, he regularly outlines how each product he promotes is enlivened, if you will, by having a unique website created, a YouTube channel, a Facebook business page, social media channels….all just for promoting one product. Sean believes paid advertising gets the best results and seemingly favors solo ads. On his incredible blog he reports that he made over $500,000 in 2015 for the CB Passive Income System and then over $600,00 the next year. He goes all in and now has an online affiliate marketing course called Aversity. Here’s a link, if you’d like to learn from a master. The Rook’s Marketing Method: The Rook’s Marketing Method takes the longest time to cash flow, but is built to create long-term passive income. Patience is needed. In fact, the owners of Income School say it takes on average over 325 days to get a 30-page blog cash flowing. To the contrary, however, many pins on Pinterest suggest a blog can cash flow within 24-hours of having it go live. FYI: Pinterest is considered a blogger’s go-to social media platform as pins last longer than ads on Facebook, and is primarily a women’s platform, and females tend to gravitate to this method of affiliate marketing. The rook is considered a heavy piece, sharing this description with the queen, because it is built solidly and powerfully and can go in any direction, in as many squares as it so chooses to go. It’s so powerful chess masters most often use rooks to checkmate the enemy king. How does this translate to affiliate marketing? The Rook Marketing Method towers is above all others in regard to enhancing one’s lifestyle with passive income and you being an authority. It is able to create passive income by virtue of its website being a leading authority site speckled with unique stories and ‘how to’ articles that help others find answers. Not only is the rook an authority by writing 30 to 50 articles on their niche product(s), but are skilled promoters who use attraction marketing on most all social media platforms. Vendors on affiliate networks provide affiliates with a variety of marketing material. Email swipes, html ads and banner, articles, videos and more. Each affiliate has their unique hyperlink so to tract the sells they bring in. The vendors often have contests of upwards of $50K rewards for meeting set goals. Affiliates will customize sales pages and landing pages for each product. Some will even create entire websites around each product. The links can be shortened and tracked with such programs as bit.ly, tinyurl.com, prettylink.com and more. Affiliate marketing works much like any sales representative’s position works, though they are not employed by the affiliate network. Let’s say you want to be an affiliate for Walmart. Simply sign into their site, fill out the tax ID and other vital info, and generate links to the product(s) you have an interest in selling. The unique link will track the sales you generate and pay you five to 20 percent typically. Some affiliates will frame entire websites around one offer, or simple place offers on social media networks. If someone purchases from your link, you get paid usually within a week. E-commerce stores are mini Amazon sites that likely specialize in “camping,” let’s say. The affiliate simply populate their webpages with companies product lines, and the affiliate is not responsible for shipping, handling or returns. They are just driving traffic to the goods and services of network companies. What does affiliate member mean? An affiliate can be a member of most affiliate networks for free. Some networks, however, prefer you have experience and will ask for proof of success in the industry or, at the least, “how to” knowledge of result-based marketing. Demonstrating your skill-set if a beginner won’t be possible, so a network might ask that you are sponsored by an affiliate with a proven track record. Noticeably on many YouTube videos, Super Affiliates will give their nods to newbies providing they join their training programs. Do note, however, study affiliate marketing before applying so when a network’s representative calls to question what your approach will be, you’ll be armed with the right answers. In other words, have your marketing strategy in place before applying. Also note, as a member of a network, you’re often assigned an affiliate manager who is there to answer any questions. They are there to help make you as success and tell you what forms of traffic are working best on the product(s) you’ve chosen. Your affiliate manager (AM) will guide you from point A to point B. They want your success. Can you make money online for free? Yes, yes, yes… you can make money online for free. The top free platforms are YouTube, Instagram, Facebook, Google and Craig’s List. Firstly, join an affiliate program. Many are listed below and all are free to join. Select a vertical you would like to be in such as the animal, health and beauty, Amazon products, make money online sector. Then select a product to promote and get your unique affiliate link. Next create a free landing page on one of the free website builders like Wix, Weebly, Blogger or Word Press. Note all have paid renditions and free. With paid you’ll buy a domain name and hosting, which allows you to be found in search engines then. From there create a YouTube channel and promote the product putting link to site in description. If creating a free video on YouTube isn’t your thing, create a free Facebook or Instagram account and begin marketing link on these platforms. There are plenty of videos that show how to join groups in Facebook and get followers on Instagram. There are many Super Affiliates who prefer free marketing, so it’s doable. Other Super Affiliates attest paid traffic is the best and brings the fastest results. Further, having your own website blog with proper domain name is a great way to start a business online, and would be your business’ main hub for various and sundry ventures into the affiliate world of online marketing. How do you start an affiliate marketing business? Starting an affiliate marketing business is easy overall, but does it takes work, developing skill-sets as a marketer and web developer. The first three steps are to decide what vertical and niche you’d like to specialize in, then create a website about the subject matter. Because the “riches are in the niches,” make sure to do proper research on topic and competitors. Go here to discover how to research niches. Next create a website and begin your copyblogging and affiliate marketing business. Write five articles about the affiliate product you decided to promote, then begin social media campaigns about the product. Below you will discover the main traffic-driving methods along with creative ways to bring more visitors to your offer(s). From here create an editorial schedule of keywords you believe you can rank for and write approximately 30 more articles making sure about one-third of each article sales contextually or visually affiliate links to product or related products. In essence, your ultimate go is to become the leading authority on subject matter of choice. This will take time, but it is well work it. Can I get an affiliate marketing job? An affiliate by definition is an independent contractor for affiliate programs. They are entrepreneurs who like taking risks and seek freedom from 9 to 5 jobs. So, the answer is you cannot get an affiliate job. You can, however, be hired by an affiliate to be their virtual assistant, copywriter, SEO guru, social media manager, blogger or task runner. Affiliates often outsource gigs on places like Craig’s List, Fiverr, Upwork and other job sites. These places are where you can land temporary work or full-time jobs. How do I start an affiliate marketing website? Affiliate websites, AKA blogs, are very easy to start. Click this link for explicate directives on starting a Word Press blog. Word Press is free. You will have to purchase a domain name and hosting, but these costs are very inexpensive. Do note many affiliates don’t have websites, they simply design landing pages that link to affiliate offers. This is a quick and reliable way to make money online, but does not create passive income or a “make money while you sleep” situation. Again, follow link above to go though steps of making a website or go to this resource page to discover other platforms to develop your website on as well as a tone of free resources for creating your site. How much money can an affiliate make and when do they get paid? The Affiliate Marketing Dude stated on one of his videos an average income for affiliates is $55,000/year, while Statisa stated it was $49,000/year. Forbes Magazine lists some outlandish amounts an affiliate can make particularly through blogging. These rang from $175.000/month to over several million per month. Notably, the larger copybloggers have dozens of people contributing stories to their websites. This means you can do the same for cheap by hiring out persons from Fiverr and Upwork. If an affiliate has a proven track record, they can get paid immediately by the affiliate network. Most affiliate programs, however, pay every week or every other week. One the front end, there are four actors in an internet marketing business. First and foremost, there’s the merchant or creator of the digital or physical product. The merchant distributes products to sell. Amazon, for example, is the merchant for thousands of products whereby affiliates often come to their internet warehouse to market and sell products for commissions. Creators are like merchants, but they created the product or digital system that is for sale. Their middle man, if you will, is an affiliate network. The creator lists their products on affiliate network sites like Max Bounty, Click Booth or Never Blue. (There are many networks listed below.) These creators often develop software, online educational courses, business systems or health and wellness products. The network aggregates their products and other vendors’ offers, assigns account managers to help affiliates, who have signed onto their affiliate marketing programs. They create directories and handle the administrative duties for vendors and affiliates. The affiliates then take links to product(s) and promote to make sales for network and creators/merchants. The fourth actor in an affiliate marketing business is the consumer. Consumers are often referred to as an affiliate’s audience or target market as their data trail indicates they have a need or desire for the product the affiliate is marketing. There are thousands of affiliate networks online and, it should be noted huge conglomerates like Home Depot, Walmart, Sears and Target have affiliate programs, too. Here’s Clickbank’s “About Us” mantra: “As a top 100 online retailer with 200 million customers, ClickBank sells digital products worldwide created by entrepreneurs. From advice for getting in shape to healthy cooking recipes and dating advice, ClickBank delivers digital lifestyle products to customers in 190 countries.” Clickbank’s top selling product is called The Devotion System. Max Bounty has over 1,500 vendor products ranging from health and dieting products, to gaming, finance and bitcoin. They have CPA, CPL and pay per call (PPC) offers. These structures allow affiliates/publishers to promote the products the way that best suits them. Max Bounty is noted for paying high commissions on well-vetted advertisers on a CPA-basis. This company also offers an affiliate program for affiliates to market its businesses. They are known to provide big bonus for those who perform at the Super Affiliate level. Their blog posts and videos are helpful for beginners and experts. Here is their blog. “We treat your business like it’s our own. ClickBooth.com is a recognized digital advertising leader and one-of-a-kind performance marketing exchange focused on driving new customers or users for our advertisers on a Cost-Per-Action (CPA), Cost-Per-Lead (CPL), Cost-Per-Engagement (CPE), Cost-Per-Install (CPI), Cost-Per-Sale (CPS) and Cost-Per-Click (CPC) pricing model. We specialize in generating consistent, quality customer acquisitions at high volumes through exclusive affiliate channels on native, mobile, social, email, contextual and search placements as well as in-house email marketing,” states Click Booth. Most of their YouTube videos and marketing seem to be from years back, but there are some current documents and web reviews in the spring of 2018. Affiliates can also earn commissions from signing up other affiliates to AWin. This pays $30/sign up upon affiliate making a sell. AWin has over 13,000 brand name items and companies is has partnered with and is in nearly 100 countries world wide. Commission Junction now refers to itself as CJ, which aggregates the world’s biggest brands. From Barnes & Nobel to Home Depot, Walmart and thousands more, this affiliate network is the largest and reaches across the globe. It deals with 150 currencies and more affiliates than other networks. Cj’s technology is incredible and geared to helping affiliates see results quickly. They have ad and content monetizing suites, analytics, non-cookie tracking and more. Here is their website. Rakuten is based out of New York City on Park Avenue. It is a mid-sized affiliate program that is one of the oldest and best in the industry. It says it pays out on a “CPA basis,” which is interpreted as upon the completion of action that is completed by consumer. One review of Rakuten says their payment schedule is sporadic. This company offers rotating banners and deep linking. Visit Rakuten here. Next to Commission Junction (CJ), Amazon’s associates program has changed lives. Off their platform, affiliates create stores pulling in niche products. This is an expeditious model as Amazon supplies and ships everything; the affiliate only markets the products. On it’s platform, associates can create stores as well. This utilizes the massive traffic sources of Amazon. The Shopify affiliate program is stupendous. It encircles an affiliate with every possible thing they may need and are there to support you immediately. It pays very well, too and encourages each affiliate to have their own store on website so they can guide newbies. Your site must have an SSL certificate to join. Interestingly, Shopify outlines provides numerous sources for affiliates to make a full-time income. They are the tops and with their help, you can easily make money online. Flex Offers has over 12,000 advertisers (vendors) and 500 premium plus advertisers. They pay on net 30 day cycle, but will pay top performers on a seven day basis “Aside from standard network services like providing text links and banners, you will soon have access to APIs, FTP, and much more. There’s no need to configure your website to work with every individual network out there when FlexOffers.com has it all,” says Flex Offers, who also has their own affiliate program. Tapgerine helps publishers monetize their mobile traffic for CPI and CPA offers. Their verticals are in gaming, adult, social, utilities and gambling. Their website is high-tech and engaging. They have 2,000 offers and assign an ad manager to each affiliate for 24/7 support. Their technology is in real time and geo-targeted around the globe. They are based out of Las Vegas, Nevada, and have an office in Russia and 50 employees currently. They work in iOs, Android and Unity. “Make money where others lose — Monetize your remnant traffic and maximize earnings from each click that doesn’t fit into any targeting category. Our artificial, intellectual server-based mechanism considers every click and conversion in terms of geo, device, OS, etc. to direct every new click you generate to the most profitable offer,” they say of their MLink trade marked traffic generator. iTunes affiliate program is a quality network that you have to get approval to promote their Apple products. Once approved, you have a slew of quality products to promote from movies, music, books, computers, devices and more. It takes five or more days to get approved by iTunes and you are to submit your website to them or you will not get approved. “We only work with qualified catalog-based merchants and vetted affiliates who are serious about affiliate marketing,” says AvantLink. They have an advanced API dashboard to keep all players abreast of data and sales updates. AvantLink is known to have an interesting tool called the SnapSearcher that is a widget affiliates can put on their websites and potential buyers can type in anything they are searching for and the tool will bring in and display items. Visit AvantLink, who specializes in retail products. ShareASale has over 4,000 merchant offers, making it one of the largest affiliate networks. About 1,000 offers are exclusive to ShareASale. This network provide reversal rates, earnings per click, average sale amount and average commission. Their metrics make it easy to evaluate what will sale or not. They pay on the 20th of each month as long as you have a minimum balance of $50. Visit ShareASale by clicking on the link. I’ve been online for a few years now and have never experienced affiliate/store owner service as stellar as eBay’s. (GoDaddy is comparable.) Store owners get the benefit of almost immediate call backs, similar to affiliates. eBay’s partner network has everything a person needs to make income online. They guide affiliates through the processes on making a bang online. Visit their program by click here. They have RSS feeds, API tools, creative suites and more. Their program pays direct deposit once a month, while store owners have this option and getting paid via PayPal. The Offer Vault is the go to source for affiliate marketers. It is an online affiliate shopping center that categorizes affiliate programs, companies, vendors and offers. Most programs you have to apply to get into individually. Offer Vault provides analytics on companies, sales data and everything an affiliate may want to know and can help in deciding what niche to go into. They offer a free training series and are held in high regard to vendors, affiliates and other online professionals. JVZoo has excellent tracking, sales stats and has affiliate cookies to help affiliates close more sales. They have an extensive library for advertisers and publishers to help them learn the best ways to make money online. For WordPress, they created an ad manager plug-in. They also have many value add-ons for e-commerce, membership sites and software licensing tools. RevenueWire has over one billion conversions and has paid out $100s of millions in commissions. Their verticals are in warrants, e-commerce, health, finance, security, downloadable software, insurance, gaming and fitness. They have been in business for a decade and are known for their high-paying commissions. They describe themselves accordingly, “RevenueWire provides a cloud-based monetization performance network and commerce platform for businesses interested in growing their revenue.” Visit RevenueWire. Regal Assets deal in cryptocurrencies, gold and precious metals and IRA investments. AvanGate is an impressive affiliate network with SaaS system installed and proven to aid affiliates and businesses of all sizes grow their digital commerce. They claim they can increase sales up to 40 percent with higher tech solutions. AvanGate assigns manager to your account immediate and provides e-commerce solutions along with marketing, billing services, channel management and more. Click here to visit website. It's very easy to become an affiliate. You simply select a niche, choose a network and product to promote, build a site and then an audience who'll benefit from the product. "Select a niche you are passionate about or that will at least retain your interest, so you keep writing, learning and instructing others about. Make your goal to become the leading authority on subject matter." According to Joy2Joy, affiliate marketing is a $6.8 billion dollar industry and by 2021, it’s projected to be nearly $11 billion dollar industry. Work-at-home businesses are highly desired. Those who have taken the leap fall mostly in the 25 to 54 years of age-range with the predominate age-range being 35 to 44 years old. Super-affiliate marketers know how to capture an audience’s attention and retain them as potential clients via the use of email marketing. They are highly skilled at driving traffic to “irresistible offers,” such as bonuses, freebies and online courses. They are generally highly skilled on social media and prefer paid advertising. For bloggers in particular, affiliate products have become their key online income source as there’s instant access to digital products and vendors’ take responsibility for its creation. According to AM Navigator, 80 percent of big brand companies use affiliate marketers, which makes perfect sense as it’s based on results or performance based marketing. A fantastic number of people use their phones today. In fact, more people are on phones, more than computers today and that’s why affiliates are doing mobile marketing more than ever before. The stats vary on this, as one site says 54 percent of affiilates are male, while others have claimed 70+ percent are males. Seemingly, it likely falls between the two. Data shows about 55 percent of affiliate marketers are married and approach affiliate marketing as a couple with each partner addressing certain aspects of marketing. One partner may produce YouTube videos, while the other writes blog posts. Publishers (AKA affiliates) are able to use many channels to influence buyers worldwide. Mobile apps, websites, social media, email, off-line and more. Affiliates are innovators in reaching and creating audiences. Affiliate marketers are becoming more and more valuable as retailers focus more on online sales. Approximately, 16 percent of online sales are generated by affiliates. According to MediaKix, fashion is the top affiliate sector. Of 550 programs evaluated, 18.6 percent of affiliate campaigns were fashion. There are thousands of affiliate networks that offer programs, items or courses for publishers to promote for commissions. Here are the top networks. Most affiliates are self-taught using such tools as other blogs, YouTube and books. There are many courses online that have stellar reputations for bringing beginners to six-figure earners. Here’s a dozen places to find top-brow information, insights and guidance. Amazon Associates are affiliates by a different name. Of the $100+ billion Amazon makes each year, about 10 percent of that is brought in by affiliate or associates, who make a larger percentage, the more they sale. There are approximately 3.835 billion internet users with Asia and India having about 1.3 billion each. North America comes in at 358 million and Europe at 743 million. As shopping online increases, so does the value and income potential of affiliate marketers. A bullet-proof plan for affiliate content marketing is to deliver value that helps readers. Do this with regularity and clarity and it will be an incredibly rewarding business for years. Remember to do your keyword research and an RSS feed. Firstly, make the choice of what type of marketing methodology you are going to do based on the descriptions provided above and below in the “traffic section.” Upon doing so, apply the appropriate formula to achieve quick success. The Knight’s Marketing Method Formula Pick an affiliate product, using Click Funnels’ free trial; create an incredible sales page; run it on Facebook (FB) using FB’s ad manager. Video directives are on Click Funnels’ website. The Bishop’s Marketing Method Formula Choose one affiliate product that will make you over $100/sale and will generate reoccurring income; create five articles all about the product on your blog; set up an Instagram account with bio linked to your blog; focus on growing Instagram to 10,000 followers fast by engaging with platform every single day. In 30 to 60 days, you’ll have a site making $5K/month. The Rook’s Marketing Method Formula For 40 days, write forty 1,500 to 3,000-word articles about your niche’s topic. Each page should have at least three money-making affiliate links on them. After each post, pin an ad that represents the article to Pinterest and Instagram. Focus on building your followings in Pinterest using Tailwind auto-poster. Make two videos for YouTube each week. Rank them. Envision your dream situation based on tangible "gets." Write down your goals in small increments with dates attached and take daily action to achieve. Don't let "money, money, money" be your motivation, but rather creating the best work on the subject of your choosing that helps others grow. Strategies are long-term goals with step-by-step action plans set in writing. Approach affiliate marketing with the strategy of using Instagram as your primary traffic tool. Give a bonus and access to your site for their email. Affiliate marketing demands certain leadership skills like delegating tasks, outsources small items, managing the books and driving to always get results. Make outline, stick to it. Know what you want to complete daily. Everyone fails and fails again. It's the winners who get up 100 times until progress is made. If something isn't working find a work around, mentor or other solutions. Be innovative. Create income solutions for others. Set reasonable result-driven goals. Manifest success. Make your first goal to sell $100/day with affiliate marketing. Provide date to achieve. "If you don't find a way to make money in your sleep, you'll work until you die." Top selling affiliate items on the internet are fashion and beauty, travel, electronic devices and healthy and fitness products and programs. These categories sell well, but the competition is fierce. If you decide to market products in these categories, you should niche down very specifically. For example, let's say you want to enter the travel category as the affiliate commissions are quite large here. Study top travel bloggers reviewing a dozen or more sites and evaluate what they offer and write about with the goal of finding a loop hole to write about. Most cover the destinations' history, food and culture. Perhaps you travel to each country's most revered writers home town like Straford-Upon-Avon in England, where Shakespeare rested his head. This will not only attract literary people, but travelers. Reward Style, Collective Style and Impact Radius are geared to help fashion devotees market stylish wears. They are affiliate platforms that will help newbies. Reebok, Nordstroms, Zappos, BooHoo, New Chic and RealReal are top paying fashion industry companies. Google Trends shows D.C, New York, Maryland, Washington and California have the most interest in fashion blogs. A blogger who has done very well in this space is Chiara Ferragni who started the affiliate blog Blonde Salad. She does a lot of social media marketing and is said to have made $8 million in 2017. WhoWhatWear, Olivia Palmero, Song of Style, Peace Love Shea and VivaLuxe are top notable fashion and style blogs that focus heavily on social media marketing too and make in the six to seven-figure marks per year. In September 2018, fashion blogs are in a break away mode per Google Trends. Gazelle.com, Grasshopper.com and Vapordna.com are the top paying affilate networks in this space. One simply pays $100 per sale. Naturally, the amount of visitors and interest in product determines sales. This industry is ever-changing and updates are a must if you're writing about electronic devices. Earnings are be incredible particularly if you review products. Wirecutter is another site in the vertical that is well worth noting. The top travel sites are Travelocity, Priceline, Orbitz Travel Advisor. Hotwire and Expedia. These are internationally known sites, in which some offer affilate programs to promote their travels. The income generated from these can be life-changing, however the single-person blogs are those you may be inspired by if you choose to begin blogging for a career choice. Here are a few samples: Practical Wanderlust currently reports making in June of 2018 $10,676; Adventure In You reported making $19,233 in June of 2018 and made total of over $100K in six months; the Local Adventurer reports they made $23,001 in July and the up-and-coming blog Where Ever Writer made $2,438 In September and is targeting a monthly income of $4,000/month.All sites have affiliate products on them as well as such things as online courses and ebooks. The top travel affiliate programs are Booking.com, TravelAdvisor.com and Agoda.com. Some affiliate programs in this space will dish out 35 percent commissions. The health and wellness sector is an affiliate's gold mine. From trending diets to fitness and life-enhancement products that help manifest one's destiny, this realm of affiliate marketing is huge, to say the least. In fact, it's a $3.7 trillion/year marketplace. A few income reports found in this sector are Hot Beauty Health shows she made $7,200 in month of April; BeWitchenKitchen shows she made over $12,000 in February of 2018; and, according to Aversity, of the top 10 best-selling items on Clickbank five are physical health products and three of in the life-betterment category. The Red Tea Detox, The Two-Week Diet, Organifi, Lean Belly Breakthrough and Better Breads and Guilt-Free Desserts are the physical ones, while the others are about how to date better, get over anxiety and how to get men to adore you. The health ans wellness industry is huge and, if you choose, the right niche, the buyers are there if the products are quality. SellHealth.com has skin care, health care, diet and more. It's an all in one health-oriented affiliate network with great support. "The money you make is a symbol of the value you create." On the internet sphere, where the deep dark web abounds along with a humongous amount of everyday commerce, you'll find just about everything is considered a website. A simple one-page sales funnel is often referred to as a website, while a simple email form or ad under a domain name is too. Fact is, anything that has a stand alone quality, whether it's one page or 1,000, is called a website by affiliates. For all intents and purposes, however, a website is generally two to 10 pages that focuses on various aspects of a business or subject of interest. The interest can be just about anything under the sun such as gaming, music, personal life stories, adventure travels....you name it, it's likely been written about. The way in which the web pages are organized and focused on are categorized according to the publishers' preferences. For example, a good many affiliates build review websites that compare a like-product to the product they are promoting. Other affiliates rather promote their products' benefits, telling stories, adding testimonials, and beefing up its life-enhancing qualities. There's no wrong or right way to create a website, it's what its creator feels will work best for them and their potential clients. Sites are often determined from the software the website developer uses, too. Nevertheless, here are a list of categories most websites fall under, followed by the types that get the most traction for affiliate marketers.Some will mix and match aspects of a few categories, while others cut straight to the chase being sales pages. A predominate factor in selecting topics feature is rather or not the affiliate feels they can rank for a particular keyword or subject matter. Directories; price comparisons; cause related marketing; blogs; loyalty and reward sites; coupon and rebate sites; membership sites; file and video sharing sites; review sites; recruitment sites; cost-per-action sites; pay-per-click sites; niche marketing and e-commerce sites. Review sites are simple, to the point and provide potential clients with the benefit of endorsements as well as concerns about the product. Affiliates are to have actually used the products to give relevant reviews. They can do so by asking vendors for a copy so they can feel confident in products. Buyers, nowadays, rely on review sites quite a bit. YouTube is one of the largest review search engines and information sites for buyers. "How to" sites and YouTube channels are the easiest ways to learn "how to" do something. Do it yourself (DIY) people are en masse and don't want to pay for simple errands, so they often query "how to" articles. If you want to build a "Smart" home and install each gadget yourself to save a lot of money, you'd likely turn to a site who helps you with this, and may just sell or review like items, too. How to sites are great lead magnets. The likes of Amazon, Smith's, Walmart, Home Depot and so many more use the loyalty system to keep clients returning. Affiliates employ this often as well by offering huge discounts or give aways upon their "third" purchase, let's say. As the saying goes, your best clients are your currently clients, so keep them happy and returning often. They are also the "word of mouth" people, who can grow your business beyond belief. Affiliates niche down, meaning the go after subjects that aren't covered, yet in demand. For example, baby items are big on internet, but there are few baby stroller websites that review the differences and price points of strollers. Because there are few blogs on this subject, it is the perfect niche. Also each stroller costs more than $100, which would fetch affiliates more money. The highly successful affiliate marketer will normally have a not-too-competitive niche so they can rank on page one, and they will normally choose higher dollar items to make more money. Membership sites are often geared to help others learn something. For example, the affiliate some affiliate programs like Conversion Pros, Wealthy Affiliate, Click Funnels and Builder All, charge monthly fees to use their software specially made for online marketers. Their fees range from $29 to $297/month and are the undoubtedly useful and educational. E-commerce sites sells goods like saddles, soap and fishing gear. Some of the most creative sites originate with Shopify as they allow you to customize store front to make unique to your personality. Most e-commerce people do not make their own products, but rather import from Amazon, eBay, Alibaba, Home Depot and the like. Affiliates who do manufacture their own goods are at the highest risk levels and well as the highest earning potential level. “Create an online experience that visually explodes with needed information and write understandable content with 1-2-3, A-B-C directives so every reader will have clarity and want to participate." Connect, engage, name drop and post your website link everywhere. Join groups, forums and social media sites foretelling everyone of your blog or insights into how your “endeavor” can enhance them. Get yourself out there and consider using auto-posters, too. The diagram to the right and further below visual explain how you should appeal to potential clients and build an audience. The end all, be all of affiliate marketing is to make conversions. Affiliates can go after making conversions a fast way, a medium-fast way, or slower, but more long-lasting way. Each have their benefits and draw backs; each have free and paid ways of obtaining traffic; and each use the same formula of attracting an audience. One, however, is condensed into a one-page sales funnel, while the others are longer narratives delivered in the forms of micro-blogs (simple five-page websites) and full-on 30+-page blogs. The most sure-fire and "regal" way of generating success online is to pay for traffic. With paid advertising, affiliates get their advertising offers straight in front of targeted audiences. Ads have to be approved and affiliate links are generally NOT allowed, so affiliates link their ads to landing pages or sales funnels, which are then linked to the affiliate offers. In essence, these "click funnels" are developed to pre -sell and warm up buyers.Sales often happen the vary day the campaign starts running. Quick, targeted and driven by the informed intelligence of the internet's social media giants. A high-bred of paid advertising fused with the more long-term sustainable model of marketing, the medium-fast model incorporates the creation of a simple site of approximately five articles about the affiliate product being marketed. This includes micro-blogging on social media sites, too. This formula treats the smaller blog as a "real blog," but only focuses on one affiliate product. Affiliates often drive traffic to the site through paid advertising or by posting regularly on social media sites and creating YouTube videos to drive traffic. Naturally, the blog is properly SEOed and built to have sustainability. The formula for a successful blog is to have 30 to 50 well-written articles on the subject matter of the blog. The articles should be at least 1,500 words and unique. This formula, in the eyes of Google, basically makes you an "authority" on the subject and you'll come up ranking on page one, provided you've done the "other" needed action steps of solid website building. Why is this model so attractive? The reasons are two-fold. One, your content will provide valuable to others and once completed, passive income can be generated for years to come. The "bulk" of information will attract a continuous audience. You'll basically be able to "set it, and forget it." This is a great retirement booster. “Colors fade, temples crumble, empires fall, but wise words endure." Presuming your goal is to create passive income or web wealth by content marketing, the most integral aspects of succeeding are using the right keywords and doing Search Engine Optimization (SEO) correctly. A keyword is a word element that deciphers the essence of a web page, article or subject. Synonyms of keyword are password, magic code, access, abracadabra, opener and secret code. Below is a screenshot from an online dictionary of the meaning of keyword to provide you with a clear and concise meaning. Drill down. Hone in. Pick a unique niche. Find your voice. The next question is, how can you make your blog stand out even further? The answer lies within being a service to others by answering the most queried questions. Below is a screenshot of often asked questions regarding the subject matter queried on a Google search about "keywords." Answer the Qs Google lists and you'll not only be able to delineate a great blog outline, but focus on what's important to readers. In turn, these subjects will allow you to target with great accuracy vital keywords, synonyms and long-tail keywords. In order to find the best keywords fill out Google's Ad Word info and it'll bring you to their keyword planner. You'll find the number of searches and lots of other similar phrases searched that will be singular words and long-tall keywords. Select five to 10 with low competition, five high competition words and then make a list of five synonyms or similar words people may use inadvertently when looking up your niche's focus. Following are many tools that will help you select keywords. These programs list hundreds of great choices. Export a CSV or jot down 15 or 20 and naturally weave in the variations into the bodycopy and headers. For the low competition keywords, Google them and then review the various sites in your niche and write down some of the keywords they are using. Search for keywords on your computer by using the following tools. KW Finder, Wordtracker, Google Keyword Planner, Answer The Public, Google Search Console, Google Trends, Moz's Keyword Explorer, Keyword Tool, SEMRush and Keywords Everywhere. The latter is the most useful and a totally free extension. Type anything in your browser and Keywords Everywhere populates the right side of your screen with the most used words, their volume and what else people searched for. When I typed in "keyword," keyword finder was the number one search for this word with a volume of 14,800/month search. Type in the same word to some of the other above trackers and the findings differ a bit. Use your judgement and use what is natural to your content. I play "casual Scrabble" on Tuesdays where players are allowed to look-up words if they'd like. It's a great way to play stress-free and learn more words. Once a month, I play the same people in a tournament, where no dictionaries or outside resources are allowed as it's truly competitive. This is the way I believe keywords should be approached. When you're writing on sub-topics or H4 (header three to five) simply use the Keywords Everywhere. If you're in the overall big topics that are highly saturated, use the big-boy keyword finders that normally allow a 30-day trial, but you have to pay afterwards. “If words are to enter men's minds and bear fruit, they must be the right words shaped cunningly to pass men's defenses and explode silently and effectually within their minds." All of the listings in this section are interconnected as they are 100 percent about getting traffic to a website or affiliate offer. Without traffic (visitors or potential clients) affiliates wither away into the land of forget-me-nots and has beens. In a word, paid traffic is the number one way to get an audience in front of an offer. Two to one, super-affiliates recommend paying for traffic on Facebook, Google, Twitter, Pinterest, Instagram, Bing, Snapchat and LinkedIn. Affiliates target their audiences, create ads, get approvals from social media staffs and boom....the ads are off and running campaigns that have be split-tested to deliver results. Money, money, money and loads of money is made this way. Organic traffic is huge too. It's done with SEO, autoposting ads and text on social media. Critical tools of the trade are outlined here to help you drive traffic to your weblog. Google looks for several things in order to rank your site and bring it to the top of queries starting with keywords, naturally. The keyword(s) you are targeting should be in the title, meta description, URL and be present in your uniquely valuable bodycopy. Next Google and other search engines like Yahoo and Bing like to see authority which is determined by backlinks, internal links, organization, sharing, length, anchor text, mobile responsiveness, user experience and speed. If you go to Blogging for Passive Income you'll find how to submit your sitemap in Google Console, install SEO plug-ins and many other steps to follow when optimizing your webpages. Click on this text box to go to the aforementioned blogging page. Below is a list of resources that go in incredible detail on explaining the steps of SEO. Moz created a extenion you can download to help you go through the simple functions of SEO. The video by Ruan Marinho provides you with step-by-step instructions, too. Wordstream specializes in enhancing online entrepreneurs website building processes. With great precision they outline the step-by-step processes of search engine optimization. Follow this link to find their article on SEO. Moz is a SEO company with over one million online marketing members. It’s a SaaS, which means Software as a Service company that has made a science of teaching others to rank sites. Click here to get their free SEO tool. It’s an extension that runs much as the Keywords Everywhere tool does. Install it, and you’ll work on SEO as you build your site. SEMRush has long-been known as a leading authority in SEO. Their tools perform site audits and suggestions on how to fix site. They also have competitor analysis tools designed specifically for you to outrank others. Click here to review their many assets and start a free trial. Boostability is a company that helps small businesses with SEO, social media metrics and consultation and guidance in developing your website. The have several packages to help you go to the rank #one. Click here. Marcus Campbell has made a massive living online as an affiliate marketer. He has many online courses and tools to use to make money online. Marcus has a remarkable YouTube channel that outlines the major aspects of affiliate marketing, blogging and audience building. He keeps it simple and action-oriented. Click this link to review his website and get his special marketing toobar. Relationships, travel, making money online, fashion, electronics and health are the most profitable niches online. If you choose to market in one of these niches, zoom in on something a bit unusual or in demand that doesn't have a enormous number of competitors. For example, let's say you want to be in the fashion sector. Choose then a segment that isn't marketed as much like jeans, holely jeans and jeans that are ripped to the point of being stylish. Frame your blog or e-commerce site around these types of jeans and bolster the site with "how to" make your normal jeans "ripped" or "acid stained." Follow it up with optimized photos of different looks these types of jeans can achieve and how older people are following the trend, too. In essence, pigeonhole an alcove. Roll up your sleeves, dig in and learn all you can about creating an effective weblog or doing tier-one search engine advertising with Google AdWords and Bing. The latter does not demand you building a website, learning SEO and writing quality content on a more long-term basis. It simply demands you create an incredible sales page (AKA sales funnel) that leads prospect consumers buying from the hyperlinked affiliate product. Tons of individuals and companies approach affiliate marketing in this fashion. The article above titled Types, Terms and Technical How Tos of Affiliate Marketing goes into detail about first search engine advertising with Facebook's and Bing's ad manager accounts. No matter if you're content marketing or going for first-tier advertising, capturing visitors' information is vital as is automating ads on social media and outsourcing of some projects. Click this text box to go to our highly acclaimed Resource page for automation, outsourcing and lead generation tools. Vying for dollars online has made the marketplace hugely innovative. Firstly to capture readers' attention, affiliates often use Lead Magnets (AKA Clickbait) to draw interested visitors onto their sites. This might come in the form of a free course, PDF, e-book or tool. Once they have some attention, the onlooker will be lured into a click funnel, which warms people to the benefits of the products. This is all good, but there are hundreds of the same products on line, so an astute marketer will also give you something of value to pique your interest even more. This is normally a bonus or two or three or four or five. On one YouTube video, I gleaned an affiliate extending five bonuses if you bought from him. The bonuses are quite often great, but may require you to purchase something as well. Often times they are what you call White Label Products in which an affiliate purchases rights to sell product or use a giveaways. Many are sought after and proven sure-fire ways of closing a deal. Sales funnels are great sales-psych tools. They are constructed to entice and invite interested parties into a web asset. Upon entering, an affiliate will earn visitors trust by offering benefits and credibility of the product through testimonials,reputation, proof, back history stories and more. Money back guarantees, 30-day trials, cost comparisons, reviews and more are laid out so potential buyer begins to believe in product. The funnel will likely have upsells that allow one into a even better product, increasing affiliates earnings. These funnels are normally used in CPA marketing, but weblogs do employ the selling tactics. 1,000s of times with CPA Affiliate Marketing. 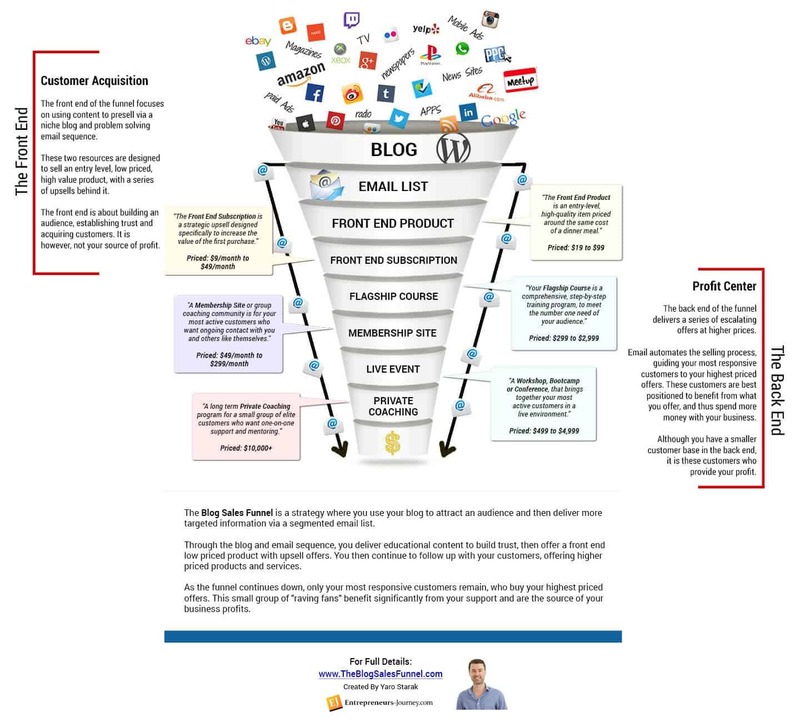 The Blog Sales Funnel brought to you by Yaro from Entrepreneurs-Journey.com. Many highly successful affiliate marketers don’t build a website or frame a blog around the affiliate product(s) they are promoting. In fact, some out- right dismiss building any content marketing site in order to go straightaway to the sale with a simple landing page or sales funnel. They get to audiences in a variety of free and paid ways. In most cases, the Affiliates post lead magnets in front of potential buyers and when someone clicks they are taken to a sales funnel that warms them up and eventually draws them to the actual product. Some vendors will pay affiliate simple for getting them leads. This means an affiliate will get paid by getting others to fill out a CPA offer. Payments can be .20 cents to $40 dollars. So, the affiliate simply puts form in front of readers and when they fill out, they’ll send them a free e-book, PDF, course, or something of value. Every one of the social media platforms have paid advertising platforms with Facebook being the largest and most widely used. Facebook's ad manager allows you to specially target an audience that is most likely to purchase your product. Take, for example, you are selling a Harry Potter item. Facebook can isolate people who have shown a keen interest in Potter making your item more likely to sell. Ditto for other social media platforms. You could go the free way by posting in groups manually or through autoposters such as Tailwind, Hootsuite or IFTTT. Rather paid or manually or through an autoposter, all have great success rates. Instead of providing audience with blog domain, you point them to the link directly or a landing page, which then goes to the affiliate link. Sales have four stages: awareness, interest, decision and action. Normally, you'll enter a funnel by accepting an enticing offer often called a lead magnet, clickbait or ultra low price. Then you'll be further enticed with testimonials, "income" potential or the like, which is sculpted to pique your interest more. Displaying proof solidifies your expectations and increases you believing in the product. Finally, prompted to make a decision and take action. Limited time offers are used to make the sale happen as are price increases and "only today" treatments. Nevertheless, the sales funnel is a highly affective way of closing sales quickly. Most funnels capture your information immediately, so they can retarget you through email marketing. It is said to take five to seven times for potential clients to hear from you, in order to buy from you. Posting on forums, other blogs and news media cites like Google News is a way many affiliates make themselves authorities to others. Upon posting a well-honed story, you'd drop your affiliate link siphoning off others' traffic. In the description of many YouTube videos, affiliates will drop their links having asked its owner permission. Google AdSense, Bing Ads, social media ads, solo ads might well be the best way to get the most traffic to your offer. Udimi, Traffic For Me, Warrior Forum and hundreds of other companies and individuals offer up their email lists to market to. These are people who want to hear offers and are likely seeking what you're targeting them for. Several super affiliates claim this is their preferred way of generating traffic to their offers. The payments vary as do results. There are thousands of authority sites that get millions of views per day. Smart affiliates will take time to write relevant articles and RSS feed them to other sites or post articles on such platforms with their websites or bylines included. Classified ad sites often give free ads to job or gig seekers, which is prime too for affiliates to post their info. Most sites do not want affiliate links on their sites, so leave phone number or email address, so you can send them links. Craig's List is on a non-stop campaign to make sure affiliate links aren't posted on their site anymore, so respect their processes and drawn prospects off site before engaging. If you have grown a large email list, you can make bank. If you haven't, solo advertising can help you get in front of targeted audiences. Solo ads are buying from an individual suppler their email list and blasting your links to them. Warrior Forum, Udimi, Traffic For Me and thousands more. Super affiliates go the email marketing or solo ad models as it's highly focused and audiences are prequalitied and opted in. The key to SMS marketing is recipients have to have opted in to wanting to see your offer. If you don't have opt-ins, the Feds will consider this spamming and you can get fined up to $10,000. The way to text message market if you do not have a list is to send phone numbers an invite merely asking if they'd like to learn more. If they say, "yes," you can prospect them further The numbers for mobile marketing are incredible and worth pursuing. To get lead generations, click on text and sign up for the The Email Processing System where a course is available at the $100 level. Using all social media is great, but focusing on one until you monetize it may be a wiser choice is you are newbie. Seasoned affilates recommend never relying on one social media network. Notably, Pinterest doest best for bloggers. "Affiliate marketing has made thousands of businesses millions of dollars and thousands of ordinary people millionaires many times over. No college degree needed, just hard work and dedication." Few affiliate marketers make much money. This mirrors real physical businesses as most go out of business in a year or two. To create realistic expectations and, perhaps burst a few bubbles, making money online is difficult for most people. In fact, there are reports that only five percent of those who try to make affiliate money actually do make money. When, however, they have an ephinany that breaks them through, the income can be great. Just like businesses that open their doors to the public, only a small percentage make it. What can help you break-through? Persistence, learning from mentors, daily action fused with sound strategies and adding value to your potential client’s well-being are the vitals for succeeding on the world wide web. The Venus Flytrap is a carnivorous eating plant that lures bugs, beetles and flies with their colorful efflorescence. Its massive jaws clamp down on prey once all four angles are rooted on the base of its tongue. Chomp. You were suckered in, giving it your credit card and other vitals, only to be upsold 12 times to Sunday. Upsell, side-sell, left-sell, right-sell, they continuously promise the grass is greener with them as long a you “give ’em your money.” Most call this the Shiny Object Syndrome, but in reality it’s more like landing on an open-mouthed Venus Flytrap, who doesn’t care if you actually make money through their system; they just want your money. So the moral of the story is to be well aware of who you give your information to and what you’re getting involved with. Many fly by night systems up even charge you monthly, though that was not mentioned in all their data. A simple rule of them is you’re best off learning to create your own story and system straight away on the web and manifesting your own destiny by learning these these simple things: how to build a website, how to do search engine optimization and how to drive traffic to your offer through social media or email marketing. Ward of black hats, bad boys and nefarious cyber criminals with an SSL certificate. This encrypts your data. Keep plug-ins updated for security, too. "Media used to be one way. Everyone else in the world just had to listen. Now the internet is allowing what used to be a monologue become a dialogue. That is very healthy. " Visual proof of earnings, losing weight, or whatever you are selling is one of the most compelling modes of persuasion. Double-down of such proof as potential buyers truly want to know their purchases are all they comes across as being. Testimonials are another way to show proof that the product is working for others. Quality over quantity. Pragmatic text over hyped-up nonsense. Genuine, true stories over exaggerated, blown-up hypothetical situations resonate best with all audiences. We've all seen the make a million this month videos that sell the dreamer's dream, but don't depict the reality of real business. Good copy writing is essential in content marketing, but what's even more important is the truth, which will build trust and a long-term online business that grows exponentially. People love reading about others and generally prefer that dossiers are delivered with a mix of verbal and visual context. Further, over 56 percent of blog readers are found to skim articles and read only the headlines and review images in more detail. Thus, sales copy with strong visuals accompanied with bullet point lists are considered more influential than content only articles. Attraction marketing is an important element when trying to convince others to buy from you. In a word, branding is an essential element of success. From fonts to color schemes and logo design, the way you brand yourself and company matter. Click this text box to go to the Attraction Marketing section for more information. "Explode your native ad campaigns by seeing what works for your competitors," is Ad Buzz's MO. This platform begins with the end goal of making the affiliate successful based on what others are doing that works. They have spy tools, a mastermind group, evaluate top business models and have top-brow skill-sets to make campaigns profit. This content distribution platform circulates publishers ads to over 500,000,000 viewers in a month. The average cost is about three to five cents per click. Xavier Kelly places ads regularly on Taboola as it has built his email list beyond any other platform. Another rock star affiliate runs her ad campaigns on Taboola, allow her to make over $70K in a year. As a native ad platform, headlines and thumbnails are extremely important. This company has "recommendation technology," that helped Microsoft and other giants increase their leads and conversions up to 180 percent. Outbrain is well-known for interest targeting and retargeting. Publishers are assigned a campaign manager to help in each ad campaign. This is an easy four-step process that is geared to drive results. One testimonial on RevContent's site claims they increased their ROI by three times what other like networks did. They have a fully responsive widget, customizations are unlimited and their reach extends to 250 billion content recommendations. "If you run a business that isn't cutting edge or doesn't naturally stick out of the crowd, it's your job to be different and get attention. The best way to get noticed is to be a trendsetter who goes beyond the essentials." Ranking in Google is harder than before, which makes it vitally important to deliver quality content with the right keywords as well as the right tools. Affiliates market in a variety of ways. Some start off without a website by running paid ads on networks like Facebook, Google, Bing and the aforementioned native ad outlets. If an affiliate is serious, not just a hobbiest, they will create a website as the hub of their business. Some will create four to five-page sites just for a niche product. Some will only work on one larger site and perfect the art of driving traffic to it using the below tools. The tools are oriented toward, of course, making more sales and being of more value to clients. User experience is important to affiliates for it gains trust, intrigue and credibility. Landing pages are where affiliates show their brands, marketing savvy and put their finger print on the products. The landing page is often referred to as an "opt-in" page or bridge page. In order for the visitor to go to desired page, affiliates capture their information, which is usually a name and email address. This page also works as a sales "warm-up" page in many incidences. Note, most social media platforms do not want "spam," so they will not take affiliate links directly. Hence, this page acts as a conduit between the traffic source (FB, Instagram,Google, et al) and the product itself. This page can make or break an affiliate's success. Click here to view landing pages found in a Google search. Pop-ups normally jump onto the screen in an ad form or form to be filled out. They are considered GUIs or graphical user interfaces that are created in Java Script. These are meant to draw the reader's attention or capture vital data.They can be useful in sales, getting subscriptions and CPA offers. It's easiest to create pop-ups with WordPress plug-ins, but you of course have to have your site built in WordPress. There are hundreds of pop-up plug-ins. some of the best list to on the side. Here are a few more: Cherry Pop-ups, Check-out Boost, Opt-in Monster, Hustle and Pop-up Builder. Over 50 percent of clients will stay on a website larger and are more likely to purchase from website if there is a live chat agent. Further, nearly 40 percent will buy simply because there is a live chat module on site. People love to engage, ask questions and be given personal service. Live chat does this beautifully. Bold360, Click Desk, Olark,are some fine chat softwar companies. Naturally, the biggest challenge is making sure someone knowledgeable is there to answer queries. Lead magnets (AKA clickbait) are irresistible and ethical bribes. The affiliate will give something of value in exchange of email and name, which allows for retargeting. E-books, cheatsheets, premade forms, checklists, software gadgets, templates, free training and PDF directives are some such things of value marketers will provide to readers to get them into their funnels and on their e-mail lists.The lead magnets are normally high-value digital items that will demonstrate your expertise in field and a way of developing rapport with potential client. Free trials are often used to get relationships going and to give client chance to test product or service offered. Coupons, discounts, quizzes, surveys and simple opinion polls are get ways to get prospects to stay on your webpage, but it gives reader chance to have fun and get some value from you. Many affiliates will offer free shipping, big discounts for multiple orders and will try their best to keep clients coming back again and again. Membership sites are often created to attract a very targeted audience who cares about the particular niche being marketing. Frequent flyers get extended mile discounts, while Motor Club of America members get over $150K/month of benefits just for being a member. Other creative ideas online marketers do is hold photo contests, chanllenges, puzzles, bonuses. Sometime they even take their marketing off-line. They may print post cards, ask city to paint vintage art with their logo largely placed, take ads out in local newspapers and more. Hootsuite says, "You’ve heard the buzz. Chatbots will replace mobile apps. Chatbots will replace email marketing. Chatbots will replace customer care agents. Chatbots will cut your costs and increase your revenue. And they’re gonna do it all while you sleep." So what are Messenger Bots? They help you converse with clients. They help with follow-through, identify leads, handle transactions and save time and money.There are several ways to start using chat bots. Facebook's bot might be the best place to learn. It's said to focus on one task at a time, then grow bot tasks to ultimately handle your social media queries and postings. Landing and opt-in pages capture a prospect's email address. This is so vital to a marketer's tool kit as it normally takes five to seven times for a prospect to actually buy from an affiliate. Having their email address enables affiliates to retarget prospects for several days or several weeks. Normally, after hearing from marketer, the prospect will either "unsubscribe" to list or purchase product. Having the right email auto-responder is important as well. Those list on the left are the primary auto-responders. BuilderAll is an affiliate program, that has an auto-reponder included in monthly membership. Gmass is Gmail's auto-responder.An affiliate's sales can 10x with an email auto-responder. Auto-posters are a plenty. From plug-ins to entire suites that'll post to all social media platforms for 30 to 50 days out are the hottest time saving and money making automated systems that are making affiliates grand amounts of money, while saving a lot of time. Naturally, affiliates drive traffic by reaching out to social media networks, forums, Quora, and other online establishments. These automated systems streamline marketers time and give them the ability to plan posts in a more timely and consistent manner. Most offer a month or two for free, then cost approximately $30/month.Many Super Affiliates has state this asset, if adhered to, can make an affiliate at least $100K/year. Before you begin your online business with Word Press or another website builder, look into BuilderAll. This is an all-in-one business platform that not only has a website builder, but a designer app, Facebook app, video creator, on-page SEO tool, click maps, sales funnel maker, email auto-responder and more. It also has a two-tier affiliate program that many have out-of-the-box made $10K their first month as they get residuals from those who sign-up below them. This not only accelerates your income potential, but creates a team-mate like community where everyone helps everyone. Why is BuilderAll worth considering? The answer is three-fold. First, it saves a lot of money. With an email auto-responder included in its $29/month or $49/month price, that eliminates having to spend money with email platforms like Get Response, Mail Chimp or aWeber. The prices for these companies are about $30/month and don’t have all the features of BuilderAll. Further, when compared to Click Funnels, hands down the pricing is significantly less and BuilderAll offers more. Secondly, the BuilderAll platform keeps everything an affiliate needs under one tidy cloud-based roof. All your campaigns, videos, blogs, landing pages are in a customized dashboard. Finally, BuilderAll knows affiliate marketing and can teach you a thing or two. In fact, being a two-tier affiliate system encourages your sponsor to help you to success. If you succeed, they succeed. Click here to take a tour and sign-up, if you feel it’s for you. The down side of being part of an all-in-one-system is there’s a monthly fee, you don’t have total control over your website (have to give up Word Press) and it can be a bit limited to interesting aspects that may be forthcoming on the internet’s sphere. If something as incredible as BuilderAll comes on the market in the future, it may be a bit difficult to break away. Screencast-o-matic or your computer's video recorder are free and are what most YouTubers use. The come with their own instructions and are as easy as turning on the recording, so your screen is being recorded as you speak. There are pic with pic choices so you may insert a recording of yourself recording the screen. It's easy and works well. Screencastify is the name of Google's free software recorder. Make videos for free and have this cloud-based software publish video to top sites across many platforms. This will also help you easily rank your videos in YouTube and other channels. Its video syndication will get you on Reddit, Tumblr, Twitter, YouTube, Vimeo and more in just one click. Video making is an art form. There are whiteboard, handwriting video makers, cartoon drawing formats. Filmora has compiled a useful list of the top video making software companies with an analysis of each program. Click this text to review what package will work best for you. John Crestani's a multi-millionaire affiliate marketer. Sign-up for his free webinar by clicking on this text. Click On Ad To Start Creating Your Money Making Machine Blog Today! According to Impact BND, affiliates are increasing their investments into content marketing by 75 percent and most say their blogging is the number one strategy they use when marketing affiliate products. Successful marketers prefer building websites and SEOing them as they build passive income over time and still can show quick results if they've perfected the art of SEO. Virtually all data points to the fact that blog and social media posts perform better when images are utilized. Tweets with images perform 150 percent better when images are included, while almost 50 percent of marketers say photos are critical to marketing campaigns. Nearly 70 percent of online and offline companies are investing in video marketing. Videos, particularly on Youtube, are proving to be the largest mode of information gathering. Invest. Facebook is still ahead of most social media platforms. Ninety percent of marketers prefer Facebook. Bloggers, however, tend to like Pinterest as the residual benefits of ads linger for months and years. Free advertising is, of course, liked though the most successful online generally paid for advertisements. Learn From The Internet's Most Elite High-Earning Super Affiliates. Make $100k+/Year Working Part Time. Click The Icons For More Info.